Over the last two weeks, there has been an increase in coyote sightings in the Bolker Park Neighborhood and along the Flood Control Channel corridor in the City of Port Hueneme. During this time, several deceased cats have been located at Bolker Park which Ventura County Animal Services have concluded are from coyote attacks. A human encounter with a coyote in a suburban area is a rare event as they are primarily nocturnal animals and live in ...the wild. Coyote attacks on humans are very unusual as they are “skittish” animals. Coyotes commonly enter neighborhoods in search of food so it is important to keep your small pets indoors, especially at night. It is also important to secure food sources such as pet food and garbage. If you encounter a coyote in your neighborhood, stay calm and relaxed. Most coyotes avoid people and will be warned off by raising your arms and yelling in a loud and aggressive manner. Please call the Port Hueneme Police Department if you experience a sighting in your neighborhood or park. Ventura County Animal Services does not respond to calls for service for normal coyote behavior, such as sightings. These calls will be recorded and documented. However, they will respond to calls which involve sick or injured coyote(s) or if there is a public safety issue, such as a coyote(s) threatening people or resting in an area frequented by people, such as a yard, park, playground, or school. Ventura County Animal Services can be reached at (805) 388-4341. Hazing – also known as “fear conditioning” – is the process that facilitates this change and is by necessity a community response to negative encounters with coyotes. The more often an individual animal is hazed, the more effective hazing will change the coyote behavior. The purpose of hazing is to change the behavior and NOT TO HARM THE ANIMAL. Examples of hazing includes standing your ground, loud screaming, making frightening noises, or spraying with a water hose. The Port Hueneme Police Department is working with Ventura Fish and Wildlife to address this issue and will be monitoring the situation closely based on the number of consistent and reported sightings by the public. If an area such as Bolker Park continues to experience dead animal remains, permits will be pulled to deploy traps in the area. 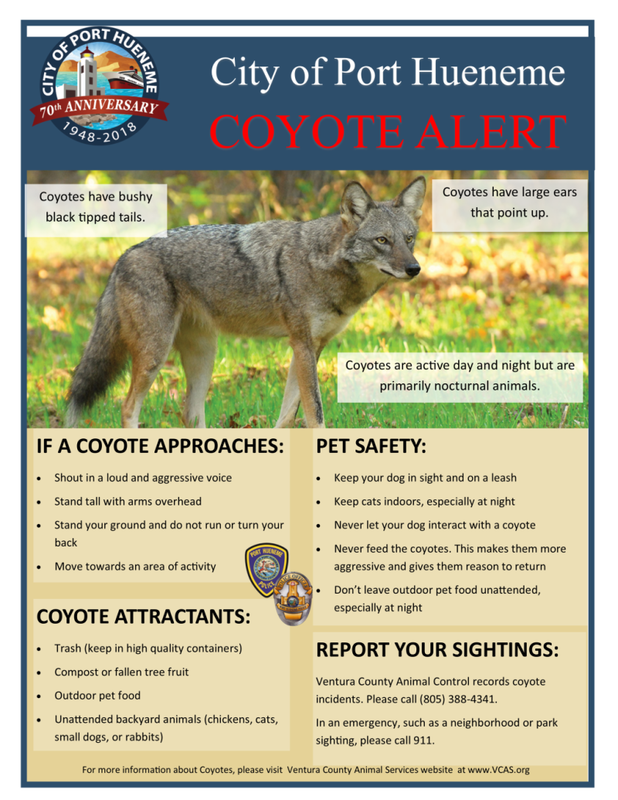 To learn more about coyotes in our community, please visit the Ventura County Animal Services website at: www.vcas.us.